January 21st, 2016. Digimon World Tour revealed several of the prizes to be given out to the winners of the various tournaments and contests being held at the Digimon Celebration in Pittsburgh this February. World Tour just announced the full tournament lineup and rules over the 16th, promising a line of Rumble Arena tournaments alongside fanart, cosplay, and trivia contests. 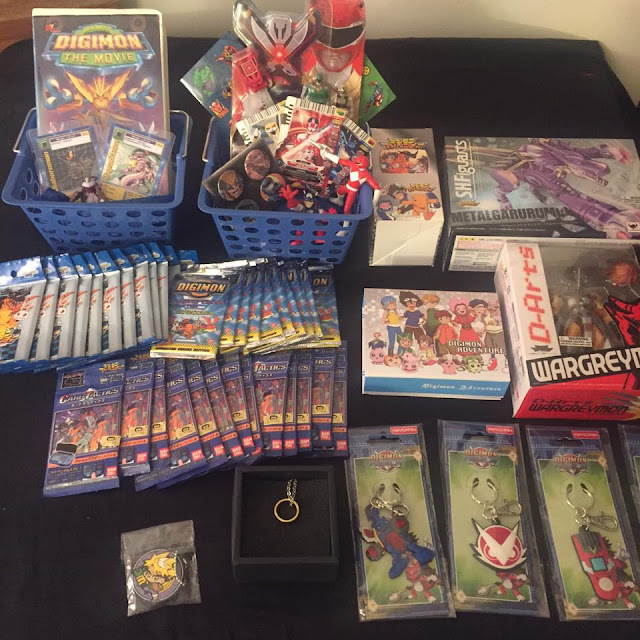 Among others, the prizes include War Greymon D-Arts and Metal Garurumon SHFiguarts figures, booster packs from the Digi-Battle Card Game, Card Tactics, and Trading Collection sets, a VHS copy of Digimon: The Movie, the film's original Andiramon and Holydramon promotional cards, assorted Xros Wars keychains, and a "Comin' Up Next on FOX Kids!" basket of Power Rangers toys. Digimon Celebration will take place at the Victory Pointe gaming lounge in Pittsburgh, Pennsylvania on February 6th, 2016. Tamer Union will be traveling to provide on-site coverage of the event. The event is being organized through Facebook, and currently 63 persons have committed to going. 144 others are "interested," and 345 invited. In addition to the gaming and cosplay events that day, the Celebration will feature artist duo Ramen Bento as a vendor, selling Digimon plush toys, stickers, and magnets. Up until February 3rd, fans can purchase commemorative Digimon Celebration T-shirts from Redbubble.